We posted a little while ago that there may be a Magenta Lumia 900 for AT&T in the works, specifically a tie-in with Mother's Day which falls on Sunday, May 13th. Sunday's are also AT&T release days. 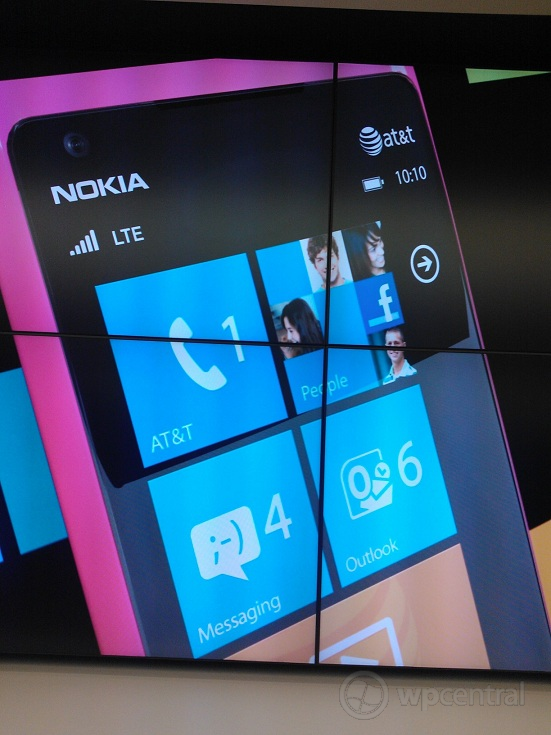 In a Microsoft store, one of our readers Clyde V. noticed this Lumia 900 emblazoned with the AT&T logo displayed on one of the demo screens advertising the new Nokia phone. Now at first we were cautious as tossing on one of Nokia's skin tight Magenta cases can also cause any 900 to look like that bold red color. But upon closer inspection this really does not seem to sporting a case (we'll let you decide though). We know the Lumia 800 came in white and a glossy white 900 followed soon thereafter (coming to AT&T on April 22nd). And we know the Lumia 800 comes in Magenta, so a red-pink Lumia 900 seems hardly a stretch for them. Anyone waiting to see what happens? Thanks, Anon, for the image!